Watering Guide – The amount of water shown illustrates the need for more water in the heat of the season and less during cooler periods. Apply 1/2” to 3/4” of water in two or three cycles to promote deeper infiltration and minimize run-off. Adjust the amount of water throughout the growing season by how often the grass is irrigated. Check the lawn as stated above to see if it needs water. Postpone or skip watering if there has been sufficient rainfall. 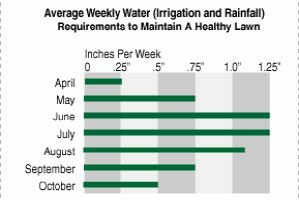 LONGMONT – As the heat continues this summer, it’s important to understand how much water your lawn actually needs, how much water you are applying and when is the best time to water. The Rocky Mountain Sod Growers are the experts in the field and want people to understand the water needs of turf so that water isn’t wasted. How much water are you actually applying? Verifying watering uniformity can be accomplished with a very simple and inexpensive method that uses only four to six flat-bottomed, straight-sided cans (gauges), a ruler and a watch. Arrange “gauges” at random distances away from any sprinkler, but all within the area you assume is being covered. Run the sprinkler for a specific time (pop-up spray heads: 15 minutes, rotors: 30 minutes). Measure the amount of water in each can, checking for uniformity. Some variation is expected, but a difference of 10% or more between any two gauges must be addressed by adjusting sprinkler coverage or repairing sprinkler heads. First stage – grass blades turn bluish gray in color. Second stage – footprints or mower wheel tracks are left when walked upon. Third stage – grass blades turn straw color. Another way is to use a soil probe, such as a screwdriver or large spike to determine how dry your lawn is. If the probe can be pushed into the soil easily, it’s probably still moist, but if it takes a lot of pressure to push it in, it is time to water. By Stacy Cornay for Rocky Mountain Sod Growers. Information Provided by Rocky Mountain Sod Growers. For more information on lawn care, sod installation and water guidelines visit sod-growers.com.